Use case diagrams are used at the development of software and systems for definition of functional system requirements or system of systems. Use case diagram presents the consecution of object’s actions (user’s or system’s) which are executed for reaching the definite result. Besides, the system’s behavior at the interaction with an object is described. The technology of the graphic representation of the use case was firstly proposed by I. Jacobson in 1986. Already in 90th many planners started using of use case diagrams to describe functional system requirements. Each use case diagram describes the scenario of execution of a definite task or reaching of any goal. For most projects many use case diagrams are created to describe all possible use case for described system. Diagrams may differ in scale and in detailed elaboration of described actions. Diagrams describing business processes describe people actions and objects which take part in business process (E.g. people which settle accounts in banks and tellers which accept money), and diagrams describing software systems are focused on data and the system reaction on this data. Thus use case diagrams of business processes describe what happens in the process and system use case diagrams describe how data interact. Have sufficient level of detailed elaboration/. Use case diagrams consist of following objects: actors, actors’ actions variants of use or connections between variants of use. Connections between actors on use case diagrams are not shown. Actors are objects which execute some actions. On the diagram actors are present in the form of people figures. Actors’ actions are called variants of use and depicted in the form of ovals named in verbal form. Include – one of the variants of usage includes the other and depends on its results. Connection is represented in the form of a dotted arrow from included use case to including with the mark “include”. Extend – one of the use case supplement the other at definite conditions. Connection is presented in the form of the dotted arrow from the supplemental use case to complemented use case with the mark “extend”. Generalization – presented on the diagram use case can be the particular case of the more general use case. In such case the connection is presented in the form of a solid line with the ending in form of an empty triangle from particular use case to general. Such connections are often used in object-oriented modelling at subclasses description. The whole system is marked out with rectangle, which denotes boundaries of the described system. Usage of use case diagrams is considered as the visual way of system requirements. Actions in the system are presented in the form of comprehensible and logical descriptions, which make system requirements obvious. 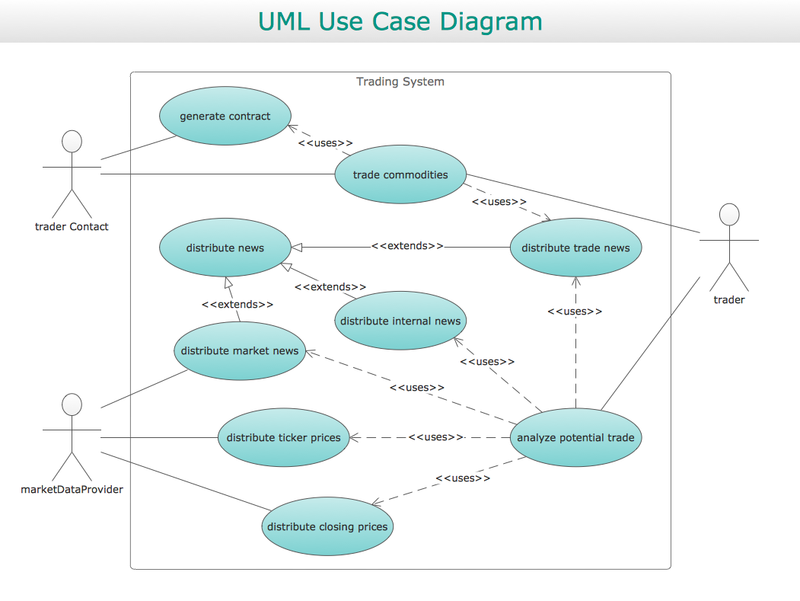 UML Diagrams Social Networking Sites Project. This sample was created in ConceptDraw DIAGRAM v12 diagramming and vector drawing software using the UML Use Case Diagram library of the Rapid UML Solution from the Software Development area of ConceptDraw Solution Park. This sample shows the Facebook Socio-health system and is used at the projection and creating of the social networking sites.